DIRECTIONS: Preheat oven to 425F. Line half sheet pan with parchment paper. Roll out pastry on lightly floured surface to 11x11 inch square. Using a sharp paring knife, gently score a ½” border, carefully cutting only halfway through the pastry. Lightly brush border with egg wash; bake for 10 minutes. Remove from oven. Pastry will be puffed up – gently press with fingers to flatten he center area leaving the border raised. Set aside. Reduce oven to 400° F. Wash and slice the carrots in half lengthwise. Place carrots on a baking sheet, drizzle with olive oil, sprinkle with salt and pepper; toss to coat. Bake for 10-12 minutes until the carrots just start to brown and soften. Allow to cool on the baking sheet. Set aside. In a food processor, combine garlic, lemon juice and olive oil. Pulse together until the garlic is sufficiently crushed. Add the feta cheese, herbs and black pepper, pulse until smooth. Set aside. Warm oven to 425° F. Spread the herby feta sauce on the puff pastry leaving the border clean. Place the cooled carrots on top of the feta sauce in angled rows with the skinny points towards the center. Add the remaining carrots in a second layer. 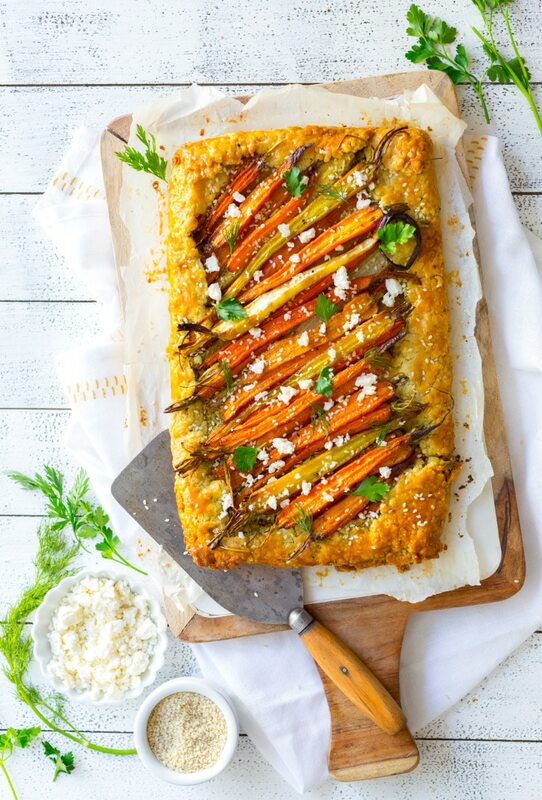 Lightly drizzle border and carrots with olive oil. Bake for 15 minutes until the pastry edges are golden and flaky. Allow to cool slightly, then top with crumbled feta, sesame seeds and fresh herbs.